Salads ordered out as well as some meats/fish/chicken often come with dressings or sauces. Sometimes these are delicious, sometimes a little goes a long way. However, dressings and sauces almost always offer plenty of kilojoules (calories) in a small amount. 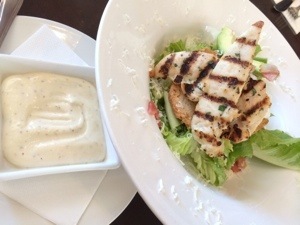 Restaurants are usually more than happy to serve dishes with dressings and sauces on the side. That gives diners total control over taste and added kilojoules, and the chance to decide whether the add on is ‘calorieworthy’. It’s just a matter of remembering to ask as you order your meal. ….or maybe the answer is Zucchini Pasta! It’s so obvious really and I wonder why I haven’t thought of it before.